Hispano Am. Apr.29 S.Martin C.
Olimpico LB Apr.29 Regatas C.
Obras Bsk Apr.27 S.Martin C.
Defending champion Olimpia de Asuncion (Metropolitan League) landed experienced 34-year old American power forward Eric Dawson (206-116kg-84, college: Midwestern State, agency: Interperformances). He played in the summer at San Lorenzo in Argentinian La Liga. Dawson has tried to make it to the NBA and played in the NBA Pro Summer League in 2014. Among other achievements his team made it to the Liga Americas Semifinals in 2017. Dawson was selected to Puerto Rican BSN All-Star Game in 2017. He is a very experienced player. And here thanks to pro basketball Dawson experienced life in twelve different countries playing on four different continents. He is familiar with European, Asian, Latin American and of course North American leagues. Dawson has played previously professionally also in China (Long Lions and Heilongjiang), Dominican Rep., France (Levallois and Chalon/Saor), Iran (Petrochimi), Japan (Diamond Dolphins), Korea (KCC Egis), Philippines (Meralco Bolts and Blackwater Elite), NBA (Atlanta Hawks, Utah Jazz and San Antonio Spurs), NBA G League (Salt Lake City Stars and Austin Spurs), Puerto Rico (Vaqueros, Leones and Cariduros) and Dominican Republic (Metros de Santiago). Dawson attended Midwestern State until 2007 and it will be his twelfth (!!!) season in pro basketball. C.Espanol P. made 21-of-24 free shots (87.5 percent) during the game. 26 personal fouls committed by Gimnasia LP helped opponents get some easy free throw opportunities. The best player for the winners was guard Agustin Perez (192-99) who scored 24 points. American Howard Wilkerson (198-84, college: Wofford) chipped in 15 points, 9 rebounds and 5 assists. C.Espanol P.'s coach Mauricio Santangelo used an eleven-player rotation in such tough game. At the other side the best for losing team was point guard Leonardo La-Bella (184-86) who recorded 25 points, 7 rebounds and 8 assists and swingman Matias Sesto (190-91) added 19 points respectively. Atenas dominated down low during the game scoring 54 of its points in the paint compared to Ciclista's 32. It was a good game for Nigerian-American power forward Lotanna Nwogbo (203-93, college: Longwood) who led his team to a victory with a double-double by scoring 15 points and 13 rebounds. 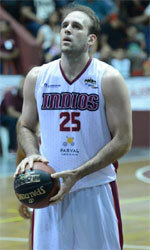 Joaquin Gamazo (198-91) contributed with a double-double by scoring 12 points and 11 rebounds for the winners. Four Atenas players scored in double figures. American forward Corbin Jackson (198-92, college: Florida Tech) answered with a double-double by scoring 29 points and 14 rebounds and Leandro Cerminato (201-98) added 6 points and 9 rebounds in the effort for Ciclista. It was a great shooting night for Parque Sur especially from behind the arc, where they had solid 52.6 percentage. They looked well-organized offensively handing out 23 assists. It was a great evening for swingman Elnes Bolling (193-91) who led his team to a victory with a double-double by scoring 17 points and 10 assists. Guard Ezequiel Martinez (187-96) helped adding 13 points and 4 assists. Four Parque Sur players scored in double figures. The best for the losing side was American Cameron Coleman (198-92, college: York, NE) with 20 points (on 7-of-9 shooting from the field) and center Abel Trejo (204-90) scored 8 points and 10 rebounds. Both coaches used bench players which allowed the starters a little rest for the next games. Rocamora made 20-of-26 charity shots (76.9 percent) during the game. It was an exceptional evening for guard Mauro Araujo (180-94) who led the winners and scored 18 points and 6 rebounds (went 7 for 7 at the free throw line). Point guard Facundo Gago (177-96) accounted for 16 points for the winning side. Rocamora's coach Juan Manuel Varas allowed to play the deep bench players in such tough game. Power forward Facundo Brizuela (203-80) came up with 18 points and 8 rebounds and American Jaqhawn Walters (198-96, college: Albertus Magnus, agency: Duran International) added 14 points and 8 rebounds respectively for Progreso in the defeat. The best player for the winners was swingman Bruno Oprandi (192-85) who scored 17 points, 9 rebounds and 6 assists. Point guard Nahuel Paciotti (183-97) chipped in 20 points, 7 rebounds and 5 assists. Four Tiro Federal players scored in double figures. At the other side the best for losing team was swingman Federico Mariani (190-92) who recorded 23 points and 7 rebounds and Lisandro Rasio (198-90, agency: Pro Sports) added 11 points, 6 rebounds and 5 assists respectively. The best player for the winners was guard Alejo Crotti (182-92) who scored 23 points and 7 rebounds. Forward Joaquin Deck (198-92) chipped in 14 points and 5 rebounds. Four Independiente players scored in double figures. At the other side the best for losing team was naturalized Italian swingman Patricio Rodriguez (191-84) who recorded 13 points, 5 rebounds and 7 assists and point guard Emiliano Correa (188-91) added 14 points respectively. Union SF's coach Juan Siemienczuck rotated eleven players in this game, but that didn't help. Villa San Martin outrebounded Obera TC 46-24 including a 16-4 advantage in offensive rebounds. The best player for the winners was forward Sebastian Picton (196-92) who had a double-double by scoring 15 points and 12 rebounds. American swingman Elijah Robinson (196-95, college: Emmanuel, GA) chipped in 17 points and 6 rebounds. Robinson is a former Eurobasket Summer League player, which is considered top international summer league in the market. Five Villa San Martin players scored in double figures. At the other side the best for losing team was American power forward Chris Hooper (198-91, college: St.Francis, NY) who recorded 17 points, 5 rebounds and 4 assists and naturalized Spanish swingman Maximiliano Martin (189-90) added 6 points, 8 rebounds, 4 assists and 4 steals respectively. Ameghino forced 21 Deportivo Norte turnovers. Deportivo Norte was plagued by 27 personal fouls down the stretch. The best player for the winners was point guard Fermin Thygesen (187-98) who scored 25 points. Forward Donovan Johnson (201-92, college: Ky Wesleyan) chipped in 18 points and 7 rebounds. Four Ameghino players scored in double figures. At the other side the best for losing team was point guard Rodrigo Gallegos (180-91) who recorded 25 points, 5 rebounds and 9 assists (went 9 for 9 at the free throw line !!!) and American forward Joshua Simmons (201, college: Dillard) added 21 points and 11 rebounds respectively. Hispano Americano de Rio Gallegos (La Liga) landed experienced 34-year old Uruguayan-German center Kiril Wachsmann (203-84, college: Iona). He started the season at Olimpia in Uruguayan LUB league. In 37 games he averaged 11.8ppg, 10.1rpg and 2.2apg this season. Good year as he was selected League Player of the Week. The last summer Wachsmann played at Indios de San Francisco (LNB) in Dominican Rep. league where in 21 games he had 5.4ppg and 5.4rpg. He helped them to win the regular season and make it to the semifinals. It was a very successful season in his career as he was selected to Latinbasket.com All-Dominican Rep. LNB Honorable Mention and League Player of the Week. Among other achievements Wachsmann won Spanish LEB Silver championship title in 2010. He received also Latinbasket.com Uruguay LUB All-Domestic Players Team award in 2015 and 2017. Wachsmann represented Uruguay at the South American Championships in Caracas (Venezuela) three years ago. His team won Bronze and his stats at that event were 6 games: 6.8ppg, 4.3rpg, FGP: 42.9%, FT: 85.0%. Wachsmann has played previously professionally also in Spain (Tenerife, Melilla Baloncesto, La Palma and Alcazar). It may be one of last seasons in his extensive career, which he may end at Hispano Americano de Rio Gallegos. Wachsmann attended Iona College until 2006 and it is his 13th (hopefully lucky) (!!!) season in pro basketball. His game is described as: An interesting PF, with great reboundings skills. Shoots well from inside, and has a good FT percentage. A classic inside operator, he doesn' t shoot 3 pointers. Traditionally, every week we bring you a list of the top performances of Argentinians who are currently playing abroad. #1. This week's number one is an international point guard Facundo Campazzo (181-91, currently plays in Euroleague). He led his Spanish team Real Madrid to a victory over the closely-ranked Panathinaikos (16-14) 78-63 in the Euroleague in Friday night's game. Campazzo was MVP of the game. He scored 13 points, grabbed 7 boards, dished 9 assists and stole 5 balls in 22 minutes on the court. Real Madrid (22-8) is placed third in the Euroleague. This year Campazzo averages: 8.3ppg, 2.6rpg, 4.7apg, 1.6spg, 2FGP: 39.4%, 3FGP: 35.8% and FT: 89.9% in 31 games he played so far. He is currently a member of the Argentinian senior national team. #2. Second place goes to an international guard Nicolas Laprovittola (190-90, currently plays in Spain). Laprovittola could not help Joventut (14-12) in their last game on Saturday. Despite his very good performance Joventut was edged 89-86 on the road by the league outsider Gipuzkoa (#18). Laprovittola was the top scorer with 28 points. He also added 9 passes. It's Laprovittola's first season with the team. Laprovittola has individually a very good year with high stats. He averages: 17.1ppg, 2.3rpg, 6.3apg, 2FGP: 52.2%, 3FGP: 39.3% and FT: 77.1%. Laprovittola is in the roster of the Argentinian senior national team. #3. The Argentinian player who performed third best last week abroad was an international forward Nicolas Brussino (202-93, currently plays in Spain). He was the major contributor in an CB Canarias' victory against one of league's weakest teams UCAM Murcia (7-19) 83-76 in the Spanish Liga Endesa on Sunday night. Brussino scored 16 points and added 3 assists in 26 minutes. Iberostar Tenerife CB Canarias (13-14) is placed tenth in the Liga Endesa. This year Brussino's overall stats are: 5.5ppg, 2.3rpg, 2FGP: 44.4%, 3FGP: 38.2% and FT: 80.8% in 27 games. He is also a member of the Argentinian senior national team. #4. Small forward Patricio Garino (198-93, college: GWU, currently plays in Euroleague) contributed to Baskonia's victory against the second-ranked CSKA (23-7) 78-68 in the Euroleague on Thursday night. Garino scored 11 points. Kirolbet Baskonia Vitoria (15-15) is placed seventh in the Euroleague. Garino's total stats this season are: 5.1ppg and 1.4rpg. He is also Argentinian national team player. #5. International point guard Franco Balbi (185-89, currently plays in Brazil) contributed to an easy victory against the sixth-ranked Corinthians (12-14) crushing them 91-65 in the Brazilian NBB last Saturday. Balbi scored 16 points, had 4 rebounds and dished 4 assists. Clube de Regatas do Flamengo (22-4) is placed first in the NBB. It was his team's 11th consecutive victory in a row. Balbi has relatively good stats this season: 10.5ppg, 3.7rpg, 5.7apg and 1.8spg. He plays currently for the Argentinian national team. #6. Guard Luca Vildoza (190-95, currently plays in Euroleague) is a teammate of previously mentioned Patricio Garino and both played together in the last Euroleague game. Vildoza contributed to Baskonia's victory against the second-ranked CSKA (23-7) 78-68. He scored 7 points and added 4 passes in 23 minutes. This year Vildoza's total stats are: 9.4ppg, 2.1rpg, 3.8apg and 1.1spg in 32 games. He is an international player who is currently on the senior Argentinian National Team roster. #7. Former international guard Juan Fernandez (193-90, college: Temple, currently plays in Italy) contributed to an easy victory against the second-ranked Umana Venezia (18-9) 104-85 in the Italian Serie A in Saturday night's game. Fernandez scored 15 points. Alma-Agenzia Per Il Lavoro Trieste (16-11) is placed sixth in the Serie A. It was his team's fifth consecutive victory in a row. There are only three games left until the end of the Regular Season. So now every game will be critical. Fernandez has averaged so far 9.8ppg, 1.6rpg and 2.7apg. He used to play for the Argentinian national team five years ago. #8. Forward Gabriel Deck (199-95, currently plays in Euroleague) is a teammate of previously mentioned Facundo Campazzo and both played together in the last Euroleague game. Deck managed to help Real Madrid in a victory against the closely-ranked Panathinaikos (16-14) 78-63. He scored only 2 points and added 3 passes in 14 minutes. Deck has averaged so far 4.6ppg and 2.4rpg in 28 games. He plays currently for the Argentinian national team. #9. An experienced former international point guard Juan Pablo Cantero (184-82, currently plays in Portugal) contributed to an easy victory against the sixth-ranked Terceira (10-18) crushing them 119-75 in the Portuguese LPB in Wednesday night's game. Cantero scored 12 points and added 3 passes in only a mere 14 minutes. Sport Lisboa Benficais placed second in Places 1-6 group. Cantero has averaged so far 7.4ppg, 1.8rpg and 4.8apg in 12 games. He used to play for the Argentinian national team nine years ago. #10. Center Daniel Amigo (208-95, college: Denver, currently plays in Hungary) was not able to help DEAC (13-16) in their last game on Sunday. Despite Amigo's very good performance the fourth-placed DEAC (13-16) was defeated 101-86 in Zalaegerszeg by the lower-ranked ZTE KK (#5) in the Places 6-10 group. He was the second best scorer with 18 points. Amigo also added 6 rebounds. This season Amigo has relatively solid stats: 11.6ppg and 6.2rpg. He is a naturalized American. Amigo is a former international player as two years ago he still played for the Argentinian senior national team. Strangely he has never played in Argentina. #11. International point guard Lucio Redivo (183-94, currently plays in Spain) contributed to a Leche Rio Breogan's surprising victory against the sixth-ranked Unicaja Malaga 83-75 in the Spanish Liga Endesa on Sunday night. Redivo recorded 10 points in 26 minutes. Redivo has reliable stats this year: 10.4ppg, 1.7rpg and 2.3apg in 25 games. He plays currently for the Argentinian national team. #12. International center Marcos Delia (211-92, agency: Best of You Sports, currently plays in Spain) is a teammate of previously mentioned Nicolas Laprovittola. But that was another game of his team in Spanish Liga Endesa which we would like to mention. Delia helped Joventut win their game against the 11th-ranked Burgos 88-85. He scored only 4 points in 10 minutes. Delia has averaged so far 4.8ppg and 1.8rpg in 13 games. He is also in the roster of the Argentinian national team. #13. Former U17 international small forward Leandro Bolmaro (198-0, currently plays in Spain) was not able to secure a victory for Barca II (9-23) in their last game on Saturday. Despite Bolmaro's very good performance Barca II was defeated 84-72 in S'Arenal by the much higher-ranked Palma (#4). He was the top scorer with 17 points. Bolmaro also added 5 passes. He averaged so far 10.7ppg, 3.1rpg, 2.5apg and 1.2spg. Bolmaro used to play for the Argentinian U17 national team two years ago. #14. Former U18 international shooting guard Enzo Ruiz (193-88, currently plays in Brazil) couldn't help Paschoalotto/Bauru in their game against Vivo/Franca in the Brazilian NBB. He recorded 9 points in 25 minutes. His team lost 82-94. Ruiz's stats this year are: 10.3ppg, 3.1rpg and 1.9apg in 29 games. He used to play for the Argentinian U18 national team back in 2006. #15. Former international small forward Carlos Delfino (198-82, currently plays in Italy) helped Consultinvest BO win their game against the eighth-ranked Roseto Sharks 92-81 in the Italian Serie A2 (second division) in Saturday night's game. He scored 22 points, had 5 rebounds and dished 3 assists in 24 minutes. Delfino has averaged so far 9.1ppg, 2.7rpg, 1.9apg and 1.3spg in seven games. He used to play for the Argentinian national team three years ago. #1. Experienced Andres Forray (187-PG-86, currently plays in Italy) led Dolomiti En. TR to a victory over the league outsider Pistoia Basket (6-21) 82-73 in the Italian Serie A in Saturday night's game. Forray was the best player in that game. He scored 14 points, had 5 boards, passed 6 assists and added 4 steals. Dolomiti Energia Trento (16-11) is placed fifth in the Serie A. It was his team's fourth consecutive victory in a row. There are only three games left until the end of the Regular Season. So now every game will be critical. Forray is one of the most experienced players in a team as it's his eighth year in Dolomiti En. TR's roster. Forray's total stats this season are: 7.2ppg, 2.0rpg, 1.9apg and 1.1spg. He has a dual citizenship: Argentinian and Italian. #2. Nicolas Ferreyra (185-PG-85, currently plays in Chile) was the main contributor in a Deportivo Valdivia's victory against the third-ranked Los Leones (18-14) 90-82 in the Chilean Liga Nacional last Saturday. Ferreyra was the best player in that game. He recorded 26 points (!!!) and added 5 assists (made all of his eight free throws) in 35 minutes. It was the game of the round between two top 3 ranked teams in group Conferencia Sur. Club Deportivo Valdivia (20-12) is placed second in Conferencia Sur. It was his team's sixth consecutive victory in a row. Ferreyra has individually a very good year with high stats. He averages: 15.6ppg, 2.4rpg and 6.3apg in 42 games he played so far. #3. Ariel Filloy (189-PG-87, agency: Interperformances, currently plays in Italy) contributed to an easy victory against the 13th-ranked Fiat TO (8-19) crushing them 109-82 in the Italian Serie A in Saturday night's game. Filloy scored 9 points, had 5 rebounds and dished 8 assists in 19 minutes. Sidigas Avellino (15-12) is placed eighth in the Serie A. It was his team's first victory after four consecutive loses. There are only three games left until the end of the Regular Season. So now every game is very crucial. This year Filloy's total stats are: 9.1ppg, 4.0rpg and 4.5apg in 24 games. He is another player who holds two passports: Argentinian and Italian. #4. Marcelo Dip (205-C-84, agency: Players Group, currently plays in Italy) contributed to Deco's victory against the fifth-ranked Olimpia Matera (21-9) 84-70 in the Italian Serie B (third division) on Sunday night. Dip was the best player in that game. He scored 19 points, grabbed 7 rebounds and dished 3 assists. Deco Caserta (27-3) is placed first in Group D. It was his team's sixth consecutive victory in a row. There are only two games left until the end of the Regular Season. So now every game will be important. This season Dip has relatively solid stats: 11.3ppg, 7.2rpg and 2.2apg. He has both Argentinian and Italian nationalities. #5. Brian Savoy (186-G-92, currently plays in Switzerland) could not help Neuchatel (2-3) in their last game on Saturday. Despite Savoy's very good performance Neuchatel (#3) was edged 95-93 at home by the lower-ranked Lakers (#5) in the Places 1-6 group. He was the second best scorer with 15 points. Savoy also added 6 rebounds and dished 7 assists. His team will play only one more game in the Second Stage. Savoy is one of the most experienced players in a team as it's his sixth year in Neuchatel's roster. Savoy averaged so far 12.4ppg, 3.4rpg and 4.1apg. He also holds two passports: Argentinian and Swiss. #6. Bernardo Musso (193-G-86, also represented by Interperformances, currently plays in Italy) contributed to a 2-point Novipiu Casale's victory against the fourth-ranked Bergamo Bsk 89-87 in the Italian Serie A2 (second division) last Sunday. Musso scored 16 points and added 5 assists in 24 minutes. His stats this year are: 12.6ppg, 3.8rpg, 3.3apg and 1.4spg in 28 games. Musso holds both Argentinian and Italian passports. #7. Enzo Damian Cena (200-F/C-92, currently plays in Italy) contributed to a 2-point Olimpia Matera's victory against the tenth-ranked Scauri 82-80 in the Italian Serie B (third division) on Saturday night. He was the best player in that game. Cena scored 21 points and grabbed 9 rebounds. He averaged so far 14.4ppg, 7.3rpg, 1.6apg and 1.3spg. Cena has Argentinian and Italian nationalities. #8. Mario Jose Ghersetti (201-PF-81, currently plays in Italy) contributed to an easy victory against the sixth-ranked Unieuro Forli 81-66 in the Italian Serie A2 (second division) in Sunday night's game. Ghersetti was the best player in that game. He scored 20 points. Ghersetti averaged so far 10.7ppg, 4.3rpg and 1.2apg. Similarly like Cena and Musso above he has dual citizenship: Argentinian and Italian. #9. Agustin Fabi (199-F/G-91, currently plays in Italy) was not able to help Benacquista LT (15-13) in their last game. Despite Fabi's very good performance Benacquista LT (#8) was edged 96-93 on their home court in Latina by the second-ranked Benfapp CdO in the West group. He was the top scorer with 28 points. Fabi also added 4 rebounds in 31 minutes. He has very impressive stats this year: 17.7ppg, 3.6rpg and 3.6apg in 25 games. Similarly like three previous players above, Fabi holds both Argentinian and Italian passports. #10. Enzo Cafferata (187-PG-88, currently plays in Brazil) managed to help Mogi das Cruzes/Helbor to win against the 12th-ranked SKY/Basquete crushing them 96-71 in the Brazilian NBB on Friday night. He scored only 2 points. Cafferata has averaged so far 5.0ppg, 1.2rpg and 1.9apg.